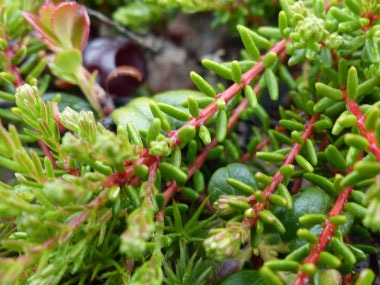 Crowberry’s generic name Empetrum, literally means "growing on rocks". 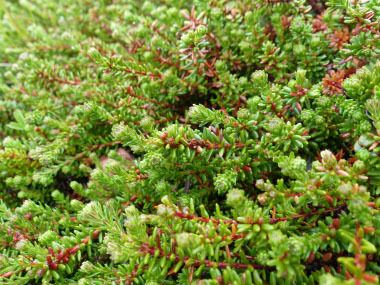 This evergreen shrub sheds its leaves only once every two to four years and it can grow in very poor soil conditions.People cultivate crowberry as a source of food, as a ground cover and for ornamental purposes. Crowberry is perennial shrub that belongs in the heather family that can survive more than 20 years in the wild. 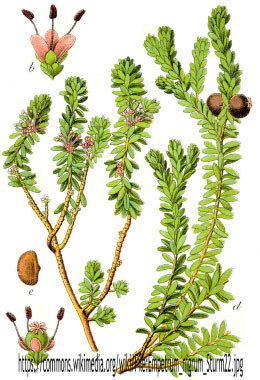 Distinguishing Features: Crowberry has narrow, simple leaves. Their sides are curled backwards. Leaves are light green and alternately arranged on the stem. 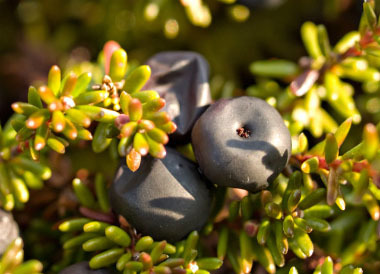 Fruit of crowberry is black, dark purple or red berry-like drupe. Fruit ripens in the fall and remains on the shrub until the spring making it a great source of food in the winter. The berries are about the size of a pea. Flowers: Crowberry is typically blooms anywhere from May to August. Magenta-coloured flowers are small, individual flowers and the seeds ripen in September. Flowers are pollinated by bees, flies, butterflies and moths. Flowers have three petals, three sepals and three stamens. Fields of Nutrition has medicinal benefits and vitamin/mineral content of Crowberry. Leaves: Crowberry leaves are alternate,whorled, stalkless, and they overwinter. They are small and grow only to about 5mm (.20”) in length. The blade is linear, needle-like, hollow, and the margin is curled downwards. The lower surface has a pale, hairy stripe. 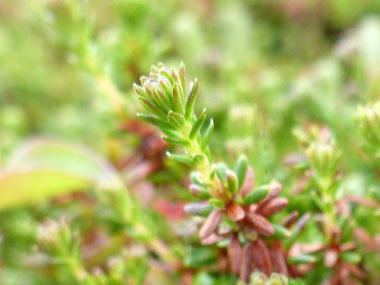 Crowberry leaves are covered with glands that produce toxic substances. When they fall to the ground and start to decompose, leaves release toxins into the soil that prevents growth of other, competing plant species. 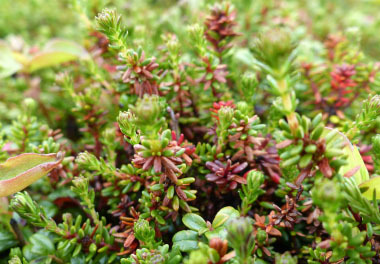 Height: Although it tends to stay low to the ground, crowberry can grow to 30cm in height (12"). Typically it is about 10cm (4") tall.The stem is limp and is often reddish. 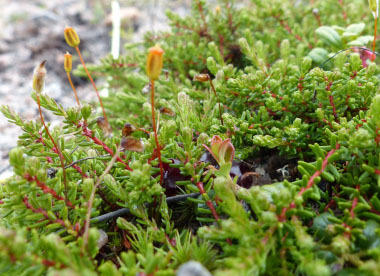 Habitat: This bush is found in forest heaths, rocky outcrops, barren bogs and in sandy locations in the Arctic and sub-Arctic regions around the world. It prefers slightly acidic soil. They are native to the norther regions of Europe, Asia and North America. Interestingly, they are found in abundance on the Falkland Islands. They grow in most areas across Canada and in the northern and western areas of the U.S. Edible parts: The berries are the only edible part although the twigs can be used as tea. They ripen in autumn and remain on the bush throughout the winter. 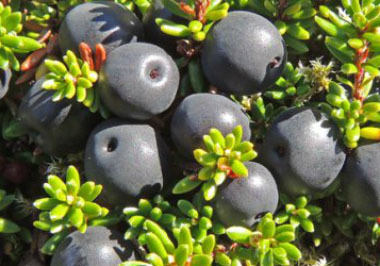 Crowberries can be eaten raw but taste better after they have been exposed to a heavy frost. The taste somewhat acrid and are generally used for making pies, wine, jams, jellies, etc. They are an excellent source of fibre and antioxidants - even better than blueberries. They are high in vitamins C and K. Crowberry is used for smoking fish in some northern cultures.